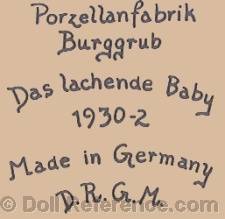 Arthur Schoenau acquired the doll factory in Sonneberg, Germany of Bauersachs & Henninger in 1884 to 1925+, they made nanking dolls. 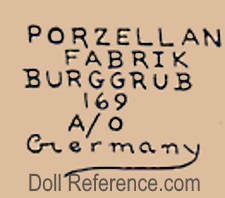 In 1901 Arthur was also a founder in the Schoenau & Hoffmeister porcelain factory, also known as Porzellanfabrik Burggrub and located in Burggrub, Germany with Carl Hoffmeister. 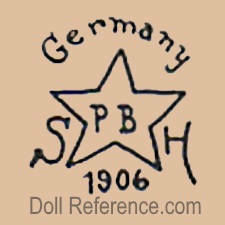 By 1907 the two partners were in disagreement as to the type of porcelain heads for their dolls. 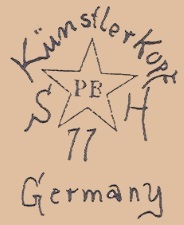 Hoffmeister insisted on producing shoulder head dolls, while Schoenau wanted to produce socket head dolls. 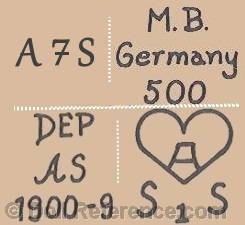 Unable to resolve their differences Carl Hoffmeister left and Arthur Schoenau became the sole owner of both factories. 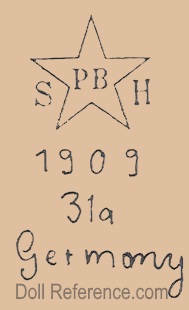 as director of the company, next directorship was Arthur's widow Caroline and son Curt Schoenau. It was son Curt who supplied the sculptor Caesar Schneider with a photo of Princess Elizabeth II of England, that was used to make their famous bisque head Princess Elizabeth doll. 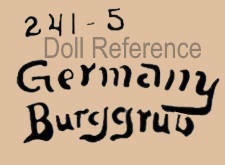 Schoenau & Hoffmeister supplied bisque doll heads to the following: Kurt Bruckner, Canzler & Hoffman, Cuno & Otto Dressel, Edmond Edelmann, Gebrüder Eckhardt, Edmond Knoch, Kley & Hahn, Rudolph Leschhorn, Ernst Liebermann, Eg. Mich Ernst Luthardt, Werner Luthardt, Ernst Maar & Sohn, Hans Süssenguth, Friedrich Voight, Hermann VonBerg. 1910+ Schoenau & Hoffmeister Character Baby or Toddler Doll, 12-30" tall, bisque socket head, composition jointed body with bent limbs, wigged, glass eyes, open mouth. 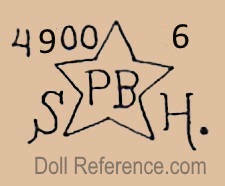 Other similar doll molds SHPB star symbol, Porzellanfabrik Burggrub, 165, 169, 170, 769, 900, 914, Special, Burggrub Baby. Character Toddler Doll mold 169, 25"
1920 Schoenau & Hoffmeister Hanna, character baby doll - 14-26" tall, bisque socket head, composition bent limb jointed body, wigged, large glass eyes, painted lashes, painted feathered brows, open smiling mouth with teeth. Shown on right; Hanna, 14" tall, bisque socket head, composition jointed baby with bent limb body, blue glass sleep eyes, painted lower lashes, open mouth with upper teeth. 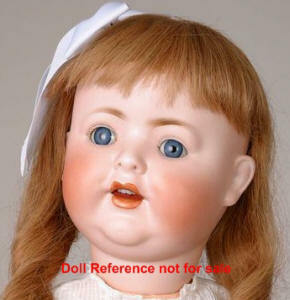 1920 Hanna, character baby doll, 14"
before 1930 Schoenau & Hoffmeister Child Dolly Face doll - 14-40" tall. 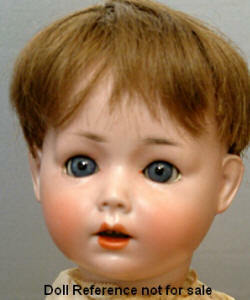 bisque shoulder head or socket head, jointed composition or kid body, wigged, glass eyes, open mouth. Child Dolly Face doll mold 1906, 23"
before 1930 Schoenau & Hoffmeister Kunstlerkopf Child Doll (art head doll) - 15-16 or 24" tall, bisque child doll with a slender face, wigged, glass stationary eyes, open mouth. ca. 1937 Schoenau & Hoffmeister Princess Elizabeth Doll - 14-24" tall, bisque socket head, jointed composition body, blonde mohair wig, blue sleep eyes, open smiling mouth with upper teeth. 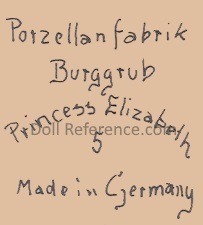 Doll marked Porzellanfabrik Burggrub Princess Elizabeth Made in Germany D.R.G.M. ca. 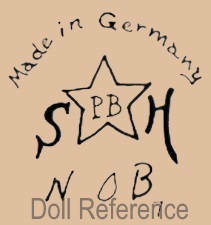 1937 Princess Elizabeth Doll, 24"
Schoenau & Hoffmeister doll mark Made in Germany SHPB N.K.B. 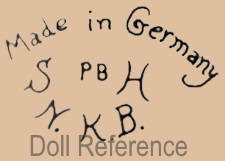 Schoenau & Hoffmeister made a named doll Viola, also made bisque doll heads for Edmund Edelmann marked SHPB Mona, Melitta or Mine and for Ernst Liebermann a doll named Violet and possibly Eli. ca. 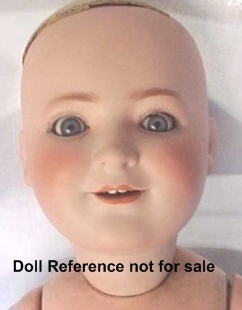 1925 Solid Dome Infant doll, 10-14" tall, bisque flange neck, cloth body, composition limbs, painted hair, small glass sleep eyes, closed mouth, doll marked N.K.B with or without a German ink stamp. 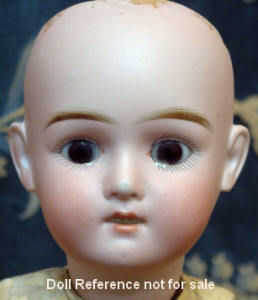 Character Doll, 12, 18-22" tall, bisque socket head, jointed composition body, wigged, rounded eyes, painted brows, open mouth. 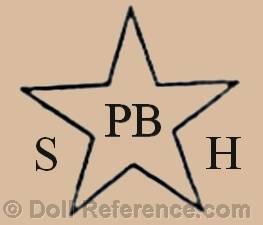 An Oriental doll mold 4900, 9" tall, doll marked SHPB star symbol OX.